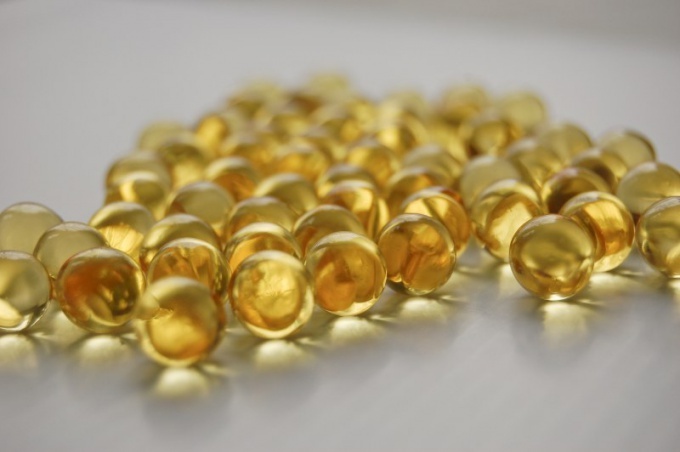 Fish oil is an oily transparent liquid, which is extracted mainly from the liver of cod fish. Because fish oil has many beneficial properties, it is used as a tonic and as part of combination therapy in the treatment of certain diseases. The fat extracted from the liver of a cod contains high amounts of vitamin A, vitamin D, fatty acids omega-3. In addition, the composition of fish oil is composed of a small amount of iodine, bromine, phosphorus, sulfur, and stearic, butyric, acetic, valeric and kupriyanovoy acids. Fish oil, due to included in its composition vitamin A, it is recommended to use with increased dryness of the skin, brittle and flaking nails. Regular intake of fish oil has a positive effect on the condition of the mucous membranes, restores brittle and damaged hair. Due to the high content in cod liver oil vitamin D it is used to prevent rickets in children. Vitamin D contributes to normal bone growth, strengthens immune system, regulates blood pressure. Consumption of fish oil promotes the production of serotonin, so this product is an excellent tool for the prevention of depression and stress. Polyunsaturated fatty acids omega-3, which are part of fish oil, are essential for proper metabolism. They must be present in the diet of pregnant women because it is done in the correct development of the fetus. Fatty acids omega-3 have positive effects on the body with inflammation, are involved in building protective shells of internal organs, lowers risk of cardiovascular disease, reduce the risk of blood clots, reduce cholesterol in the blood, heal ulcers of the stomach and duodenum. Helpful fish oil is for the treatment and prevention of beriberi. Normalizing the process of digestion and fat metabolism, omega-3s reduce excess weight, so fish oil is recommended to be consumed during dieting. Fish oil can be used not only inside but also externally. It is used for healing burns, they smeared dry psoriaznae times. Used as a nourishing facial masks, smeared them with the tips of the hair, preventing their separation.